The Bausch Conundrum: Como el musguito en la piedra, at BAM. by marinaharss.In Uncategorized.3 Comments on The Bausch Conundrum: Como el musguito en la piedra, at BAM. 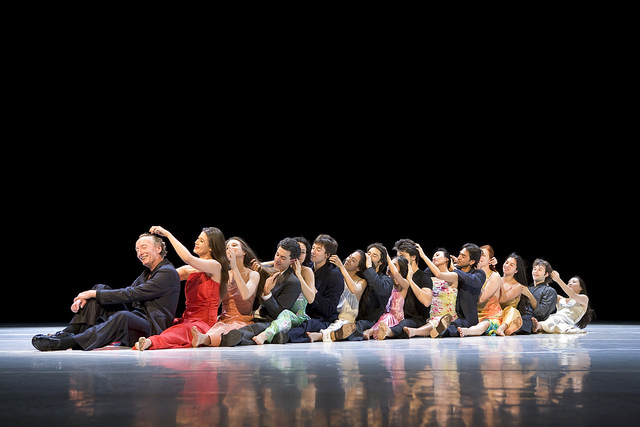 Tanztheater Wuppertal in Pina Bausch’s “…Como el musguito en la piedra, ay si, si, si…” Photo by Laurent Philippe. Art is one of the most subjective experiences around. I’m reminded of that often when I’m at the theatre, feeling elated by something I’ve just seen, and hearing someone complain about the self-same thing, or vice versa. I’m always shocked, for example, when someone says they’re bored by Twyla Tharp’s In the Upper Room—how can one not like In the Upper Room?! Or the films of Wes Anderson? Or Schubert’s songs? They seem so immutably fine, so well-constructed and intelligent and essential. All of which brings me Pina Bausch, and her final opus Como el musguito en la piedra, ay si, si, si, completed just weeks before her death. It is playing at the Brooklyn Academy of Music through Oct. 27. Bausch’s works are adored by fans the world over. Almodóvar has included passages in his movies, Wim Wenders has rendered them in 3D in Pina; great dancers dream of performing them. But I’ll just come out and say it: for the most part, they leave me cold. There are moments, I’ll admit, when an image or an idea will ignite something in my brain. I’ll think to myself: here it is, finally, I am about to enter Bausch’s enchanted garden. But it never lasts; the image passes, the idea is replaced by another, usually less compelling, and then another, and the door closes again. The colorful ball gowns, the high-heeled shoes, the feigned smiles and anguished moues, the little vignettes that lead nowhere, the Dadaist humor which almost never strikes me as funny, not to mention the endless repetition…it all wears me down. As soon as you see something clever, you can be sure you’ll see it again, six or seven times. Most of all, I find the solos—where most of the real dancing happens—unimaginative, essentially variations on the same small repertory of movements. Once in a while a particular dancer will accentuate a specific ingredient, and things snap into focus: I’m quite moved by Dominique Mercy’s deconstruction of balletic poses and awkward musical contrasts, for example, or Ditta Miranda Jasjfi’s shimmering fingers, or Fernando Suels Mendoza’s beautiful, precise footwork. But for the most part, the solos blend into each other; the dancers fold at the waist, swish their hair, roll, squat, whirl their arms, touch various parts of their body, twist, spiral one way and another. The men’s solos cover more ground, but for the most part the elements are very similar. They look improvised, and probably spring from some form of directed improvisation. It’s clear they are not meant to be experienced as dances, exactly, but rather as impressions, portraits of mental states and emotions. The nightmare image from “Musguito.” Photo by Paula Lobo. Musguito is filled with these private dances, even more so than other Bausch works; they are strung together, separated by the usual Bauschian vignettes. This is how the second half of the three-hour evening begins: A man (Mendoza) sits on a chair and flirts with one woman after another—“Pero qué chica tan linda, qué linda eres, wow”—and then Jasjfi is carried onstage by another man, and Mendoza and Jasjfi do a tender little dance (he raises her in rocking lifts, caresses her hair, gently pulls up one of her legs, etc.). That done, a woman appears with a plastic bag full of sparkly costume jewelry; smilingly, she puts on a necklace, a ring, a bracelet and then, finally, the plastic bag itself. (Laughter.) Then the dancers place tiny lamps on the floor and someone says “it’s the constellation of Pisces,” and the dancers lie down on the stage and stare at the sky. This is followed by Mendoza’s solo, peppered with delicate coupé turns and accompanied by the raspy voice of the Argentine singer Daniel Melingo in the wonderful song “Cha Digo.” And then a another statuesque beauty—Bausch’s dancers are all ravishing and ravishingly different—comes onstage and begins to scream something that sounds like “Haider!” and a man appears and kisses her hand, and she slaps him, hard. Then, another solo, more swishing hair, more squats, more languorous foldings at the waist. The best, most moving part of Musguito is the music, songs like “Deja la Vida” and Violeta Parra’s “Volver a los 17,” from whose lyrics the show’s title was derived. The words are haunting, poetic, and bleak, and the arrangements spare, faintly Andean, lilting and chant-like. They express a profound sadness. Their sadness infuses the dances, but because the dances are completely self-referential, the emotion they produce is non-specific, the expression of a vague malaise. Musguito has almost nothing to do with Chile. In fact, when the image of the two separated lovers returns as part of a general recapitulation at the end of the long evening, it no longer has the same effect at all. Perhaps Bausch never meant it as a reference to the violence of the junta. Perhaps it’s simply another example of Bausch’s ongoing fascination with the relations between men and women. For this is the dominant theme in Musguito and much of Bausch’s oeuvre: the dynamics of love, power, and attraction. A man complements a woman and she answers “bla bla bla”; another man pours a bottle of water on a woman’s head as she applies makeup with great dignity; a couple walks arm in arm while a sneaky seducer steals a kiss. It’s always about men and women in the end (interestingly, homosexual love does not enter the equation, at least in Musguito). This is the real heart of the matter. Of course, it’s the stuff our lives our made of. But not only this. Wes Anderson films & Schubert lieder? Okay, I’m smitten. Just say you also adore Wallace Stevens, and I’ll call it love. And I’m smitten with your writing on dance. This Pina piece is a classic. Jewels of the World, Unite!